Facebook is the only place from where every computer geek start his online journey. No doubt it is the best platform to connect and join hand with new people. Being active on Facebook is must if you want to start online business. What most of the people do is they create a new fan page. It's good. But the thing that matters is how we manage it. On the other hand we have groups. In comparison with pages, we always under-estimate them. One of the main reason is they aren't SEO friendly ( stands for search engine optimization ) and yeah I agree with this statement. No Facebook groups are indexed in search engines. Moreover they did not give any backlinks and can't be promoted. Instead of these drawbacks, they can be Goldmine for us if used in right way. 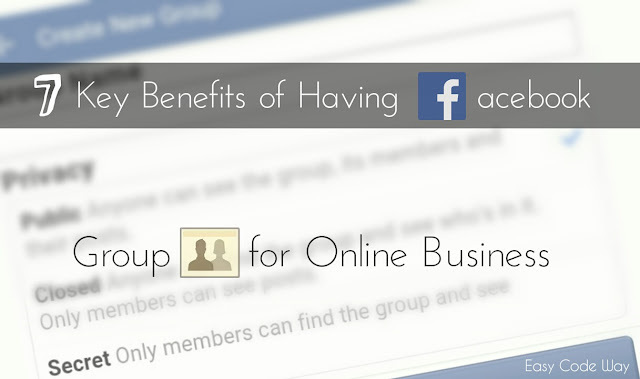 In today's tutorial I am going to tell you 7 little-known benefits of having Facebook group in name of your online business. So Lets Start! Facebook groups are open for all users. Anyone can create them in just few seconds. Moreover you can directly add your friends without inviting as it was in case of Facebook pages. Not only you but anyone having group membership can add his or her friends. This would be great for us to reach new audience and its like getting them for free. You can ask your close friends/family to add more members and this chain can be more long If you ask your friends of friends. One more thing which I like most is groups are suggested by Facebook itself. As in case of pages, we need to promote them in order to get more likes but groups are promoted for free. They are shown under "suggested groups" section to those people who really matter and have same interest on which your group talk about. For an Instance, If someone being a fan of your work want to ask few questions and queries then how can it be possible? For every successful online Business, being in contact with your followers is one of the major thing. In such cases Group can be a way for your followers to connect with your Business and they can use it to ask questions and contact you. Apart from asking questions, people from all around the world can connect with other people. This would provide friendly environment and more people will find interest in your work. Again if you compare groups with pages, anyone can post in groups which isn't possible in case of pages and there is no posting limit. This is another plus point. Using commenting system other people can also join conversation. For an Instance, If at a time you aren't available to read posts then any other person can reply to it. On the other hand, while in conversation another can also counter-comment which will develop new ideas on same topic. So this all will help you to build your own online community of people having same niche interest. In page, we post on the behave of page name but in group, it is you who have to post all content as admin i.e your name will appear in post but actually you are writing on your Business behalf. As you continue to post for a long period of time, people will find more interest in you, as a result of which your respect will gradually rise among them. Same thing happen to me. Very first I stared a Facebook group named as "Hack Everyone". In earlier days it was just a normal. Later on I worked on it and within few months group member list goes beyond 25k+. I used to post around 10+ article daily which make me popular among all members and they started sending me friend requests and message for personal tutorials. Most probably you would be having Website for your online business and Yeah it is must. Now groups can be used to increase your website traffic. Inter-link your both website and group. Just tell your group audience about your website and make a note on your website linking to your Facebook group so that new comers can join both. As soon as you update website with new posts, share them on group in a way to like you're asking questions. For Example: If you had posted on "How to make popcorn", than you can write something like this inside caption: "Did you ever wanted to know how to make popcorn? If yes, read this article and let me know whether it's easy or not?". This will improve more users engagement and build better trust with them. It's been said that Emotional Marketing is the best way to attract audience. Few Years Back Facebook has added uploading feature in groups using which you can upload any type of file except two which are exe ( executable file ) and mp3 ( audio file ). The maximum file size limit is 25mb, same as that of G-Mail. Also Facebook has integrated Dropbox ( cloud storing online website ) uploading system in it which let you upload already uploaded files from Dropbox. However these feature are also lesser known and therefore less used. We can use them for better connection with our readers. For example: If you own a tech related website/online business, you can upload pdf, docx, ppt etc., files so that readers can also stay with your work even when they are offline. This feature has probably plus point when compared with pages where you can't upload any file. No doubt all what I mentioned above will ultimately result into increase in brand awareness and reputation. You just need to work hard for few months and results will speak itself. So these are the best reason of having Facebook group for your online business and I personally find them helpful. Now it's over to you what you want. Here are few more tips to optimize your group performance. First of all have a custom URL for it. You can get it by going to settings. Fill out all about section with rich keywords that describes your work in attractive way and give website link their. Regularly Update Group with new posts. Regularly Pin Posts and Change them time to time. Engage With audience by replying to their queries. Finally I just want to say that their would be no loss in trying it for once. So just go ahead and enjoy using it. If you have any suggestions or want to ask something, make use of comment system below. I am waiting.